The history behind the blue police telephone posts in the City of London and Westminster. One afternoon strolling through the City Of London, I happened upon an old Police Telephone Post, on the junction of Queen Victoria Street and Friday Street outside Bracken House. I had very rarely seen posts and the larger Police Telephone Boxes in the capital – in fact most are so well hidden you may never even notice them. After taking a photo of the well-preserved one near Mansion House tube station, I was intrigued to find out the history of them. Of course, when most people see a Police Box today they are likely to think of the Tardis from the Doctor Who TV series. While the Time Lord’s Tardis is a huge time travelling machine with lots of space inside to move around (and fictional! ), the real things managed to squeeze in a telephone, first aid kit, a stool, fire extinguisher and small heater. Police boxes and posts were important tools for the Metropolitan Police from the late 1920s until the late 1960s, when they began being phased out with the advent of personal radios. From a peak of 685 in 1953, there aren’t many left in London today. However, some have been left in the city’s streets as a reminder of the world before mobile phones and radios came along and changed modern policing. Generally they remain a light blue – their official colour in the City of London, however some have been painted different colours. Police Telephone Posts and Boxes aren’t unique to London and were actually introduced in Glasgow in 1891. However, while English posts were blue, Scottish ones were red. It wasn’t until the late 1920s that they were introduced in London by the Metropolitan Police. 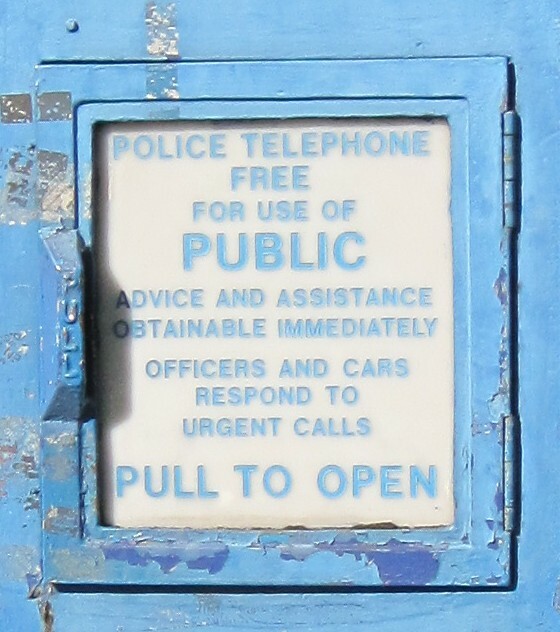 Posts and boxes were for officers on the beat and the public to use to contact the police – an alternative to 999 when people didn’t have access to their own telephones or mobiles. At the top of the post is a red lantern, which would flash when police were required to contact their station. It’s thought the square frame surrounding the bulb was inspired by Sir John Soane‘s lantern feature at the top of the Dulwich Picture Gallery. In a bit of nostalgia, a police phone box was erected outside Earl’s Court tube station in 1997… unsurprisingly it attracts more Doctor Who enthusiasts than anyone else. All the Police Telephone Boxes I found in the City appeared to be well-preserved, with a sign informing the public they can no longer use them to contact emergency services. It reads: ‘An original police telephone. Free for use of public. The telephone is no longer operational. Please use nearby payphone.’ Given that hardly anyone uses payphones these days, the signs were probably written some time ago. However, in the City of Westminster, it appeared the council aren’t so bothered about the state of their old posts. The post in Piccadilly Circus – on the junction with the northside of Piccadilly – was looking quite sad. It has been incorrectly painted a wrong shade of blue and due to its location on such a busy thoroughfare in terms of both foot and vehicle traffic, it’s taken a battering over the years. The telephone post located in Grosvenor Square in Mayfair is also looking rather neglected. Although it’s the same shade of blue as the ones in the City, the black ‘Police Public Call Post’ sign near the top is missing. However, the old sign on the door still suggests you could use it to call for help. It reads: ‘Police telephone free for use of public. Advice and assistance obtainable immediately. Officers and cars respond to urgent calls. Pull to open.’ Perhaps a bit misleading to a visitor from out-of-town… no one is going to come if you try to use this post! A completely different style of telephone box to the Tardis ones appears in London’s iconic Trafalgar Square. Many would have passed the circular box, which has been described as ‘Britain’s smallest police station’. It was built in 1926 out of an existing lamp plinth (the lamp fitting dates back to 1826) so police could keep an eye on demonstrations in the Square. It was created to blend in with the walls of Trafalgar Square after public objections to previous designs. Inside was a phone line direct to Scotland Yard and whenever it was picked up, a flashing light in the ornamental light on top would flash alerting nearby officers to trouble. No longer in use by police, it’s now used to store cleaning equipment for City of Westminster street cleaners. For Metro Girl’s blog post on another tiny police station in Hyde Park Corner, click here. To find out more about London’s old Street Furniture, read about a Georgian water pump on Cornhill or The myth of the Coco Chanel street lights. Posted on 14 Jun 2012, in History, London and tagged 1920s, City of London, history, street furniture. Bookmark the permalink. 5 Comments. A great post, you did well to find them all! Until a few years ago, the arch in the middle of Hyde Park Corner was home to a tiny police station too.